In the tenth century BC, one of the earliest known states to be set up by the encroaching Aramaeans was Bit-Bahiani. It was centred on ancient Tell Halaf, one of the main sites of the Neolithic Halaf culture of around 5500-4500 BC in northern Mesopotamia (now in the Khabur Valley in modern Syria). 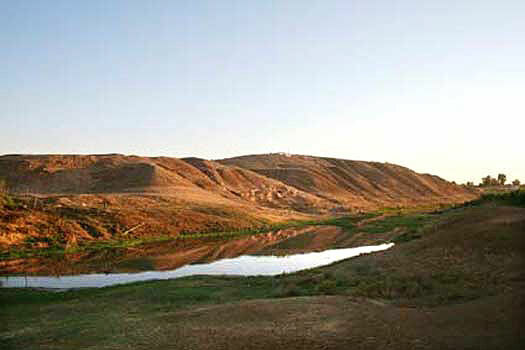 Although the area was one of northern Mesopotamia's earliest centres of habitation, when the Halaf was replaced by the Ubaid culture the site was abandoned for a long time. Reoccupied by the Aramaeans in around the eleventh century BC, it flourished for a time under their control as it controlled important trade routes through the region. Details about the kingdom are limited mostly to references from the Bible and Assyrian records, as local inscriptions are very limited in number. Bit-Bahiani emerges as an Aramaean territory which is centred on Guzana (Tell Halaf, the Old Testament's Gozana). With the city reaching its peak under Kapara, the king builds a palace at Guzana in neo-Hittite style from which 187 reliefs would later be discovered by archaeologists and which at this time decorate the base of the palace's south wall. The reliefs alternate between red ochre-tinted limestone and black basalt slabs. Adad-Nirari II of Assyria makes Bit-Bahiani tributary to the empire. The ruling house remains on the throne but as far as the Assyrians are concerned, they are nothing more than governors. The city of Sikani seems to be their religious centre, housing the god Adad. King of Guzana and Assyrian governor. King of Guzana, Sikani, & Zarani, and Assyrian governor. Now an island territory which is surrounded by Assyrian conquests, Bit-Bahiani is reduced to a province of the empire. Surviving the fall of Assyria, the city remains inhabited into the Roman period.